Below is my contribution to the Crop and Pest Report that will be released today, June 18, 2015: It does not include the spotty rain activity around this morning that should not amount to much at all. In the next week, the weather over our area will be influenced by two features well away from North Dakota. A ridge of high pressure in the mean upper-level wind flow over Alaska and another strong ridge of high pressure that will be situated over the southeastern portion of the United States. These two features over North America will create a southwesterly flow aloft over North Dakota and Minnesota, meaning that the main storm track with at least two storms will impact the region in the next week. Each storm will have the ability to tap into Gulf of Mexico moisture leading to a risk of localized heavy rain. Current projections of the timing of those two storms that will move across the Northern Plains will be on Friday into Friday night and the other one on Monday into Monday night. Both of these storms will have potential to drop 1 inch or more of rain in some areas, probably in narrow bands as the rain moves from the west to the east across the area. Plus, each of these storms will have potential to come in multiple waves during a 24-30 hour time period. In between these two stronger systems, a weaker system, mainly a wind shift line, may trigger spotty to scattered storms on Sunday. Certainly not all areas will get excessive moisture in the next 7 days, most will not, but this type of pattern is conducive to 1 inch plus rains to fall. 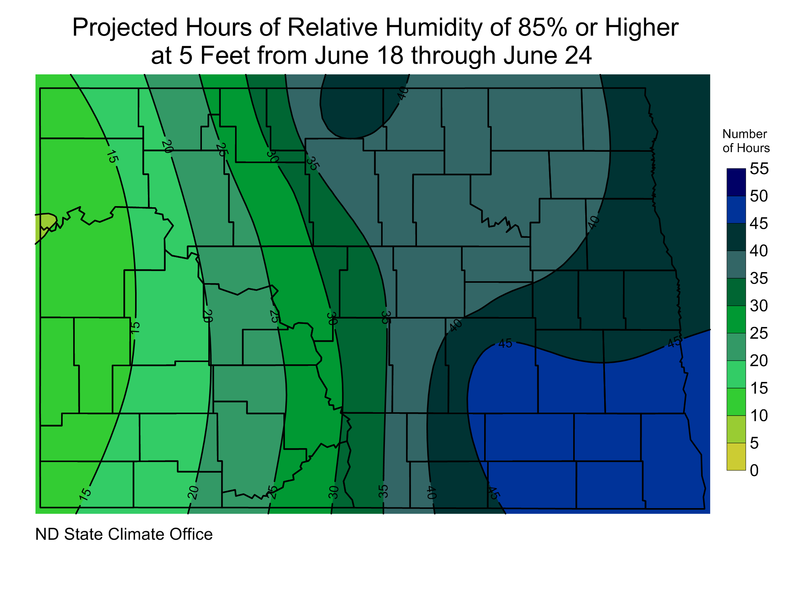 Because of these potential storm systems and the associated cloud cover and moisture, the low level relative humidity will have the potential of being higher than 85% on several occasions. Included in the graphics package this week (below) is the estimated time, in hours, that such levels will be achieved during the next week. The exact track and amounts of rainfall will of course cause localized variations over small distances. 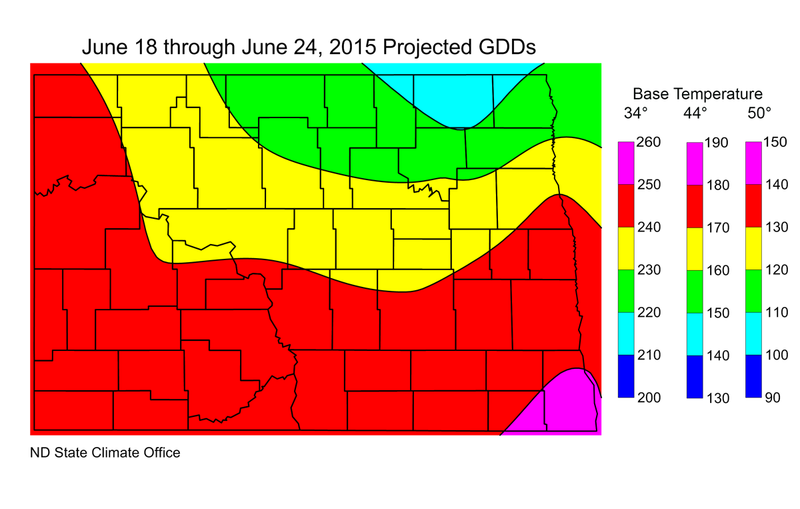 Projected growing degree days (GDDs), base 34°, 44° and 50° for the period June 18 through June 24, 2015 are presented below. Although the maximums will generally be near or slightly below average, the projected frequent nighttime cloud cover will mean the minimums will be above average and therefore a significant factor in attributing to the GDD numbers during this period.